The extras arent extra at drury hotels. Your Great rate includes free hot food and cold Beverages at our 5 30 kickback/ free hot Breakfast/ free wireless internet access and Free long distance. Our 5 30 kickback Includes a rotating menu of chicken tenders/ Meatballs/ baked potatoes/ soup/ salad/ beer / wine/ soda/ mixed drinks and more -subject To state and local laws-. Don t miss our great Free hot breakfast buffet with sausage/ Belgian waffles/ biscuits and gravy/ fresh fruit / bagels/ and pastries. Take advantage of free Popcorn and soda every evening from 3-10 P.m. As well as our complimentary exercise Room/ and 24 hour business center. Come visit Us in san antonio. Conveniently located only 15 miles from six flags fiesta texas/ sea world / shopping and many other attractions. 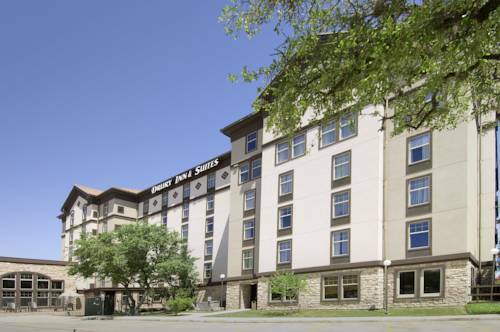 This Hotel offers 119 standard guestrooms and Two-room suites family ownership makes Drury hotels distinctly different by providing a Consistent experience at more than 130 Hotels.for eleven consecutive years j.d. Power has recognized drury hotels with the Award for highest in guest satisfaction among Mid-scale hotel chains. Come stay with family At drury hotels. Miscellaneous information free hot quick Start breakfast buffet served daily free evening Beverages and snacks served monday to Thursday 5 30pm to 7 00pm indoor pool and Whirlpool indoor corridor 25 inch digital cable Tv free local phone calls one hour of Domestic u.s. Long distance calls per Night iron/ironing board in all rooms Hairdryers in all rooms coffee/coffee makers in all rooms exercise room guest laundry Voice mail in all rooms 100 percent Satisfaction guaranteed awards 3 diamond Aaa rated. Our Free Hot breakfast buffet includes sausage/biscuits and gravy/waffles and more Our 5.30 Kickback includes a rotating menu of chicken tenders/meatballs/ hot dogs/soup/beer/ wine/ soda/ and more -subject to state and local laws-. Convenient to I-281. Located just minutes from Six Flags Fiesta Texas.Convenient to Great Shopping and Dining. -Airport-SAT- San Antonio International Airport - 9 miles south-Directions from Airport-Take highway 281 north. Then west on loop 1604. Hotel is on the right. Exercise room including a Bike/Treadmill and TV is available at no charge to Hotel Guests 24 hours a day.